Everyone talks about the Clarisonic, but what if you don't want to pay £100+ and still want to try one out? I picked up No7 Facial Cleansing Brush when it was only £15, plus it was with my Boots points. I've tried the Clarisonic once so I can't compare them properly, but looking back, there's basically no difference. To use the No7 Facial Cleansing Brush, I apply my cleanser of choice to my face, which is currently REN Rosa Centifolia Cleansing Gel*, before putting the wet brush onto my face. It has two settings, medium spin and a fast spin, but I usually stick with the first setting as the faster one can be a little harsh. 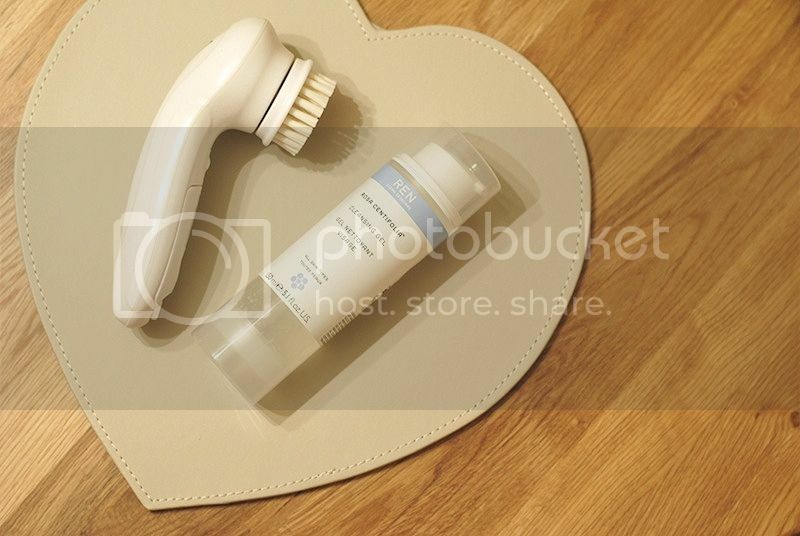 By combining the cleansing brush and the cleansing gel, it gives my skin a deep clean. People can sometimes break out by using this, so I haven't used it more than twice a week. As well as giving my skin a deep clean, it gently brushes off the dead skin on the top. I started to use it when my skin was becoming a little flakey and the brush exfoliated it off. I don't use it for more than a minute at a time, so I don't agitate my skin. Not only has this helped exfoliate my skin, it has helped improve the overall texture of my skin, as it does become a little rough along my jawline. Just make sure you don't use a foaming cleanser with this, or else you'll end up with a bit too many bubbles. Listen up ladies, there's a product around which will make your cuticles disappear. I used it once and it looked like I had been for a professional manicure! Normally found in the US, however it's popping up in some Boots stores, but I found mine in TK Max for £2.99. Sally Hansen Instant Cuticle Remover is a thin gel which you apply to your cuticles, or any dry hard skin around your nails, before leaving it for 15 seconds. Grab one of those cuticle sticks and push them back, whilst dragging the gel off your cuticles. It's gross at first because you see all the white gunk on the stick, but your left with completely polished cuticles. Previously I used the Sally Hansen Gel Cuticle Remover, which sort of disappeared if you left it too long, but I won't be going back now. This stuff is seriously amazing. I'm giving my nails a break at the moment and only popping OPI Nail Envy on so after using this, my nails look good. You can buy it on Amazon but I'm sure you can track it down in TK Max or on eBay! "nails", "the nails", "the review"
Now there is no denying I love Origins, they're my favourite skincare brand by far and I've never not liked a product. When I picked up the GinZing eye cream a few months back, I loved it and was hoping they would bring out a moisturiser version. So when this came out, I was dying to get my hands on it. Origins GinZing Energy-boosting Moisturiser* is a lightweight, oil-free moisturiser. It contains skin boosters such as panax ginseng and coffee bean, which also jump starts the hydration levels. I've been using this on a morning and for now, due to having dry/dehydrated skin, it's enough for my skin. It sinks straight into the skin, leaving a lovely citrus scent behind, which isn't too strong. It's suitable for all skin types, with its gel consistency, it doesn't sit on top of your skin if you're worried about that. It's a perfect moisturiser for the morning to wake up your skin, especially as I have seen a difference that my skin is brighter. Costing only £23 for a 50ml tub, it's brilliant quality and is available from Boots or online. What do you think of this, have you tried it yet? I don't own that many highlighters, I usually just use MAC Mineralize Skin Finish in Soft & Gentle, but it's a little too 'glittery' for my liking. BECCA used to be available in the UK easily, but then it went away and finally it's back on the Space NK website exclusively. So when I had been wanting a few things, I put an order in and finally ordered the BECCA Shimmering Skin Perfector in Moonstone. BECCA Shimmering Skin Perfector is a liquid highlighter, which can be used in different ways. You can mix it with your foundation, or apply it as a primer before your foundation, for an all over glow. Or you can use your ring finger to apply it to the high points of your face! If I'm using a matte foundation, I will use one pump and mix it together and apply with a buffing brush. But most days I've been applying it after my foundation. One pump can sometimes be too much product to use just for your cheekbones so half a pump is enough for cheekbones, temples and down the centre of the nose. Moonstone is the golden shimmer shade out of them, other shades available are Pearl, Opal and Topaz, so there is a shade for everyone. It will set you back £33, but you get 50ml and for how little you need, it will last you a long time. Have you tried this before, or what is your favourite highlighter?